“It is essential that we at the NDMOA discover the work of our own artists who haven’t yet crossed our radar.” The exhibition may include works from artists from N. Dakota, S. Manitoba, NW Minnesota and NE S. Dakota. This event honours one of America’s most beloved and creative curators, Walter Hopps (1932-2005), whose 1978 “ Thirty Six Hours” was the first such known exhibition of this type. One of Deborah Danelley’s intriguing book collage works titled “Challenged” will be exhibited for this event. Artist in attendance: Saturday October 1 and Thursday October 20, 7-9pm. The title of this exhibition – the Pathos of Things, is a literal translation for the Japanese aesthetic idea known as Mono No Aware. It simply means empathy toward things, or a compassionate sensitivity to or identification with things outside oneself. It is also about an awareness and acceptance of impermanence, and a celebration of the natural beauty of things aged or in some way infused with the patina of life. Often, the materials I use or the subject matter I am drawn to have been abandoned – used, misused, broken, damaged by time, rejected or just no longer needed. Like human scars, these are the very things that make someone or something unique. For me they carry physical proof of both strength and resiliency; they have had the ability not only to endure but to be transformed and now re-experienced for the appreciation of others. For two weeks this past July, Deborah was invited back to Havana by Cuban curator Magdalena Rivas, to participate in an international group exhibition titled “Por la Boca Muere el Pez” at the Galeria de Arte, “la Moderna” in Centro Havana. Six new book collage pieces were created specifically for this exhibition, expanding on her Meditations on Landscape series but this time titled “Havana” Series V.
The pieces were well received by artists, curators and the director of the gallery, and Deborah now has several major opportunities for future solo and group exhibitions in 2017 in Havana and possibly Santa Clara, Cuba. Cuban artists from a barrio in Havana, Cuba known as Muraleando, will have the opportunity of a lifetime – to exhibit their work outside of their community and outside of their country! 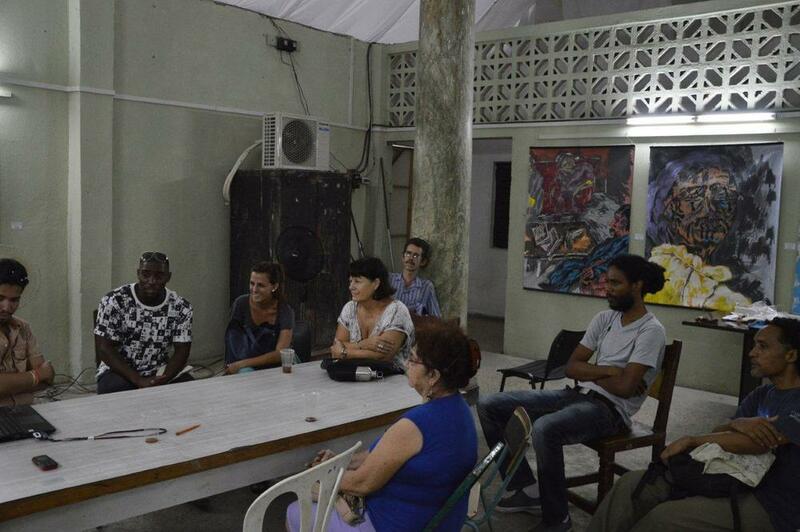 Deborah Danelley has been travelling to Havana for the last 7 years to volunteer alongside these artists, in the Muraleando Community Art Project. GFA is proud to celebrate Mentoring Artists for Women's Art (MAWA) 30th anniversary with In Celebration of Women's Art - an exhibition that supports and celebrates the rich diversity of women artists. Opening September 5th at 7:00 PM, it features four gallery spaces of artwork featuring the women artists of Gurevich Fine Art. The exhibit will also feature visual artist Caroline Monnet’s installation Amik(waa), presented by Winnipeg's Video Pool Media Arts Centre. Caroline Monnet will also host a presentation at GFA on September 6th at 1:00 PM. Gurevich Fine Arts is pleased to announce the 2nd Annual Summer Group Exhibition – Secrets from the Vault. Join us at the gallery on July 4th and August 1st for First Fridays in the Exchange District. If you missed the Art and Architecture Exhibition, drop by and see my recent work. As part of a group exhibition to welcome members of the Royal Architectural Institute of Canada to Winnipeg for their 2014 Festival, Deborah will be showing new mixed media work from her collage series. Deborah creates a natural aesthetic and form of abstraction with her sophisticated use of repurposed material, in particular old books. Rough, torn or precisely cut fragments are built along strong, imaginary or visible lines, with a subtle neutral palette of colour and texture. 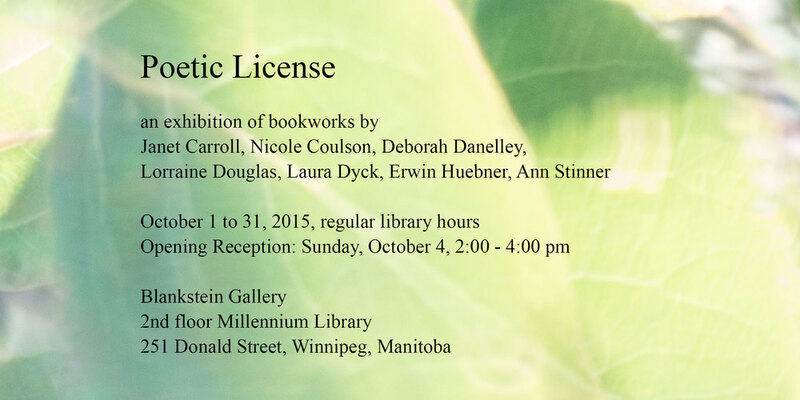 Join us for the launch of an exhibition of contemporary artists’ books and to celebrate the acquisition of Kew Garden’s journal Curtis’ Botanicals, donated to the University of Manitoba Archives & Special Collections by the family of renowned Manitoba horticulturalist Frank Skinner. In addition, early botanicals from the early 1700s and on from the Rare Book Room of Archives & Special Collections will be displayed. The masculine strength of John Erkel’s metal and mixed media pieces shown alongside Deborah Danelley’s paper-based work compliment and contrast each other showcasing the beauty of things industrial and organic, impermanent and incomplete, the beauty of things unconventional. A group show featuring Winnipeg Artists/Photographers such as Lisa Bedard, Deborah Danelley, William Eakin, Richard Holden, Ted Howorth, Keith Levit, Tracy Peters, Jason Poturica, Don Reichert, Sheila Spence, Diana Thorneycroft, Dave Swieciki and many more. Deborah is pleased to announce that her Mixed Media and Print work will now be represented by the Gurevich Gallery. For more information or inquiries please contact Howard Gurevich at (204) 488-0662. Before Deborah Danelley became an artist, she worked at a company that sold software that helps people decide on a particular vocation. “It was a program that allowed students to input information about themselves and their interests, and it would spew out different types of career options,” says Danelley. Later this fall, Deborah is pleased to present Salvage, a solo exhibition about the inherent beauty of the book form and how when deconstructed and reinterpreted, it can be resurrected and repurposed once again. Although unusually cool for an August evening, the climate was hot in Agora Gallery last night, as people poured into the reception to see the selected artists from the Chelsea International Fine Art Competition as well as Agora’s collective exhibition The Kaleidoscope of the Mind. Please join Debbie and other Manitoba artists who were invited to participate in this interesting project currently on tour. A bi-annual art magazine that provides artists, collectors, museums, galleries, art organizations and enthusiasts with access to the work of internationally talented emerging and established artists as well as feature articles, reviews and interviews. Check out an article on Deborah’s work in Cuba in the Humanitarian Section of the magazine, "To Havanan with Love: The Muraleando Community Art Project", pages 71-72. Danelley has been back every year since—always bringing with her suitcases full of donated art materials, sundries and clothes. That dedication has earned her a nickname: the ‘Canadian ambassador’ of Muraleando.